"How does he plan to accomplish this herculean feat? ", you ask. Well, don't be so puzzled, the answer is pretty simple. He has so far given us plenty of clues. For years now, his Modus Operandi has consisted of rapes, ethnic cleansing, kidnapping of children, use of child soldiers, mass murders, genocide, attacks on refugee camps,... you name it. Any other war crime on the books, he has done it. 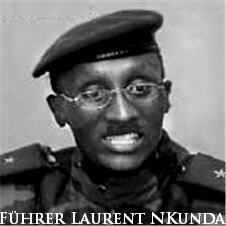 Simply put, Laurent Nkunda wants to be the Führer and Supreme Guide of the Congo by any means necessary. And what if 5,400,000 Congolese should die along the way, 30,000 dying each month, more than 1,000,000 innocent civilians displaced? Well, Laurent Nkunda says it's all worth his ego. "Who will stop me? ", he asks. "They can all die for all I care" ... "I am Laurent Nkunda, damn it! I will rule over the dead if I have to", he adds. Pretty dramatic, hein? Well, I think not. This is exactly what this Nazi copycat and Adolf Hitler admirer has been telling us and doing. And like his despicable idol, he shall fail miserably. Laurent Nkunda will never be President of the DRC, let alone Reichsleiter of North Kivu. There will be no march to Kinshasa, no victory speech at the stadium, and no crowning moment at the Marble Palace. But rest assured, mark my words, there will be justice one day. History has a long memory.